Facilitate the further development of European standards to address and improve container security specifically and supply chain security in general and progress towards a single international shipping containers security standard. 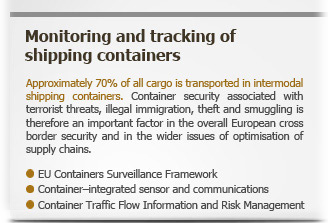 CONTAIN is aimed at specifying and demonstrating a European Shipping Containers Surveillance system in a global context which will encompass regulatory, policy and standardisation recommendations, new business models and advanced container security management capabilities. The partnership covers Security Systems Integrators, Telecommunication companies, International Security solution providers, ports, ship, rail and road transport service providers, transport ICT solution providers, research and consultancies from nine EU countries, Norway and the USA.